NINE different choirs from ethnic communities throughout Brisbane archdiocese delivered a joyful soundtrack to this year’s Multicultural Mass held in St Stephen’s Cathedral on Sunday, August 25. Representatives from about 20 communities, including Chinese, Vietnamese, Spanish, Italian, South Korea, Sri Lanka and the Philippines, many in traditional national dress gave additional splashes of colour to the event. The Maronite and Syro-Malabar communities were also represented. 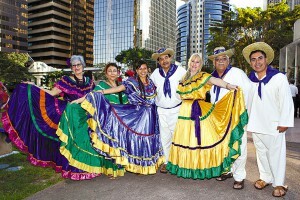 Celebrant Archbishop Mark Coleridge of Brisbane welcomed the various communities in many of their own languages. Ten priests ministering to the archdiocese’s various ethnic communities concelebrated the Mass. Sacred Heart Missionaries Bishop Ambrose Kiapseni of PNG was one of the concelebrants. Centre for Multicultural Pastoral Care director Ursuline Sister Anne Surtees said the Mass readings and prayers were delivered in some of the languages of the various communities. “Also memorable was the singing of the Samoans as they entered in the Gospel procession,” she said. Sr Surtees said the Mass was followed by food prepared by the archdiocese’s various ethnic communities. “Hispano-American communities representing countries such as Columbia, Chile and Peru provided entertaining singing and dancing during this part of the celebrations,” she said. The celebration was organised by the Ethnic Ministers Group, various ethnic communities and the CMPC to conclude National Migrant and Refugee Week.